Peel onion and garlic Then chop top and end of carrots. Chopped the carrots into bite size, onion into thinly slices and finely chopped garlic. In a saucepan, melt butter. Add vegetables on low heat to sweat them in butter for about 5-8 minutes. Pour the stock and bring to boil, season with salt and white pepper; cover and cook for 25 minutes until carrots are tender. Stir in juice and zest of orange. Remove from heat and let cool for 10 minutes. In the meantime, cook asparagus with a bit of butter until tender. Then cut the croissant into half , spread with butter and warm in microwave for 30 seconds until butter melt. Liquidise the soup in a blender until smooth. 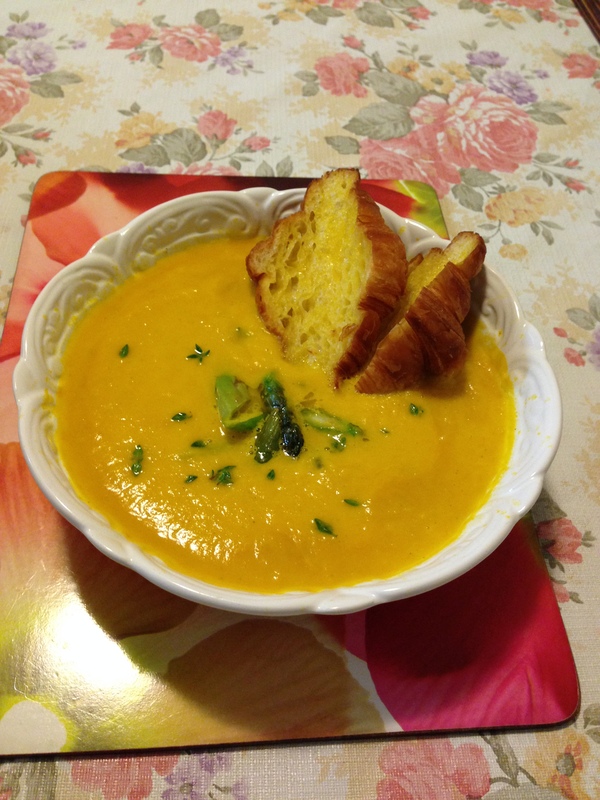 When ready to serve the soup, warm up in microwave for 1 – 2 minutes, stir in between and garnish with oregano; place croissants 2 halves and asparagus into the soup.